the first day of holiday, Labor Day, was sunny. 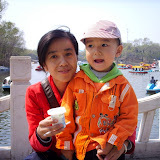 we hashed to visit the only park in Qiqihar, Longsha park. we bring baby son played on mini-train and mini-tank. we saw some birds and monkey and cranes. we saw camral and bears. baby slept on the bus returning home in my arms and we relayed to hold him in sleep home after the nearest stop. then situation went worse.last dinner ema brought baby some pears and banabas and claimed that only for baby. baby also claimed he will eat all. i felt very repulsive on ema’s all time bragging her money power and separating baby from others of the family. after dinner i took half of an apple and suggested her buying some cheap fruits for all next time. i also told her that food should be shared, not separated by people within family. ema kept cold shoulders in the coming days. i in the 2 days also felt boring and threatened. i slept in the afternoon for 2 hours each day, while ema busy with tutoring. my life likes in a cold cage, depend on other like ema’s decision. ema frequently boasts the power of money she dirtily earned by meanlessly tutoring. all time she was energetic upon it, which i felt quite wrong. she let some students, most were students in her classes, to follow her tutorial even in holiday just to earn money. most of time in tutorial was ineffective. the students likely silent lamps. she always let it clear that i earned less then hers, and made any chance to protect baby against my influence. she made situation forcing baby to ask for her help and in result let baby totally in her controls. i let baby playing pc games, which i think would be the future generation’s routine, but she constantly shown dispise. she bought a lot of packet food, just let baby eat less staple. she and her mother bought lots of nutritional and lurked baby to take and ruled to let baby eat a day one pill, but baby constantly asked her permission to take. she let baby care-demanding and under her irregular rage’s control and lack most due independency. baby frequently ask for her attention and if her in right mood. she let baby weak. i saw a lot of poor parency and felt hard to correct it. each time i tried to mend it i got ema’s revenge in cold shoulders in coming days. i trust God my fate and my lasting life, and known God will shine on my baby. i had to fight to live with these ugly family life in peace. i trust God to bring me to peace in the end of my life. below was photos shot on Labor Day. the movie was shot in the afternoon which was a gloomy day, just like yesterday.